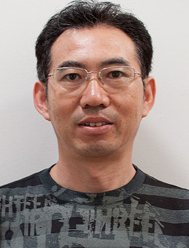 Yizhou Chen leads the development of the animal molecular genetics and microarray facility in the Department. He also works closely with the Entomology Group in Elizabeth Macarthur Agricultural Institute on molecular mechanism of insecticide resistance in western flower thrips and cotton aphids. He joined the Department in 2006 as a Livestock Officer and has undertaken research projects through the Beef CRC on identifying genes related to feed efficiency in beef cattle by whole genome association and microarray gene expression. Before joining the Department he worked for over 12 years with the University of Sydney as research fellow, and completed a variety of research projects funded by national and international bodies. He has published more than 30 peer reviewed journal and conference papers. Insecticide resistance monitoring with qPCR and next generation sequencing. Chen Y., Dominiak B.C. and O'Rourke B.A. (2016) A single multiplex PCR reaction for distinguishing strains of Queensland fruit fly Bactrocera tryoni (Diptera: Tephritidae). Austral Entomology, (early view DOI: 10.1111/aen.12190). Sved J.A., Chen Y., Shearman D., Frommer M., Gilchrist A.S. and Sherwin W.B. (2016) Extraordinary conservation of entire chromosomes in insects over long evolutionary periods. Evolution 70, 229-34. Al-Husseini W., Chen Y., Gondro C., Herd R.M., Gibson J.P. and Arthur P.F. (2015) Characterization and profiling of liver microRNAs by RNA-sequencing in cattle divergently selected for residual feed intake. Asian Australas. J. Anim. Sci (doi: http://dx.doi.org/10.5713/ajas.15.0605). Chen Y., Bogema D.R., Barchia I.M. and Herron G.A. (2014) Quantification of the pirimicarb resistance allele frequency in pooled cotton aphid (aphis gossypii glover) samples by taqman snp genotyping assay. PLoS ONE 9, e91104. Al-Husseini W., Gondro C., Quinn K., Herd R.M., Gibson J.P. and Chen Y. (2014) Expression of candidate genes for residual feed intake in Angus cattle. Animal Genetics 45, 12-9. Herron G.A., Langfield B.J., Bogema D.R. and Chen Y. (2014) Baseline susceptibility and cross-resistance in Aphis gossypii Glover (Aphididae: Hemiptera) to phorate and sulfoxaflor. Austral Entomology 53, 32-5. Chen Y., Vanlerberghe-Masutti F., Wilson L.J., Barchia I., McLoon M.O., Smith T. and Herron G.A. (2013) Evidence of superclones in Australian cotton aphid Aphis gossypii Glover (Aphididae: Hemiptera). Pest Management Science 69, 938-48. Chen, Y., P.F. Arthur, I.M. Barchia, K. Quinn, P.F. Parnell and R.M. Herd. 2012. Using gene expression information obtained by quantitative real-time PCR to evaluate Angus bulls divergently selected for feed efficiency. Animal Production Science 52: 1058-1067. Chen, Y., P.F. Arthur, R.M. Herd, K. Quinn, and I.M. Barchia. 2012. Using gene expression profiles in bulls to evaluate steers divergently selected for high and low residual feed intake. Animal Production Science 52: 608-612. Chen Y., Gondro C., Quinn K., Herd R.M., Parnell P.F. and Vanselow B. (2011) Global gene expression profiling reveals genes expressed differentially in cattle with high and low residual feed intake. Animal Genetics 42, 475–90.